About 40 years ago when I was still a child I experienced my first sardine run. It was not a large run but big enough for me to earn some money for myself. 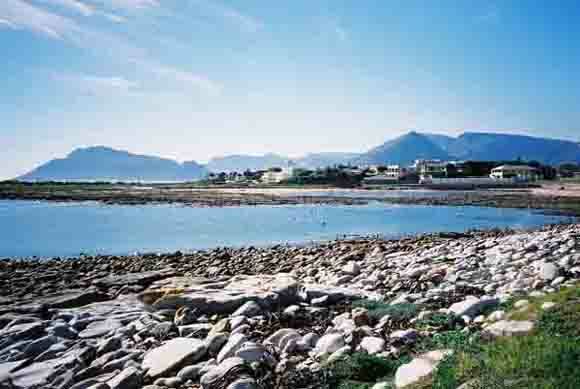 As most of you know I lived in Kommetjie and there we had a sea water pool called “The Kom “. It was filled by the high tide and when the tide pulled back it left the Kom full of water and sea weed that had drifted in on the tide. This weed eventually rotted and caused a nasty smell. The authorities cleaned out the pool area from time to time and it was after one such clean out that this event happened. The pool was relatively empty and as the tide came back the haarders (Sardines) as we know them all gathered close to the inside of the wall as the fresh sea water started to flow over it. There were thousands of them and you could just put your hand into the water and grab them. I wanted to catch some and used my scoop net to do so. I scooped out 20 or 30 at a time. Some other kids got in on the act and brought some buckets which I filled. Soon we had a large pile of fish lying on the grass next to the pool. When the fishermen saw the sardines their eyes lit up and I was in business. The fish were sold at 25 cents per bucket full and soon the whole pile was gone. What I have just described happens on a much larger scale along the SA coastline between May and September. Sardines which normally live in the cold waters of the Cape get it into their heads that they must swim about 1500 kilometres up the coastline to Durban. When this happens they form large shoals which are kilometres long and can be seen from miles away. As they arrive off the Wild Coast the fast flowing Agulhas Current forces them inshore and into shallower water. This is when the party starts. People, birds, whales, sharks and dolphins are invited to the feast. Dolphins hunt in groups and swim into the shoals and between them force the fish into what is called a bait ball. Once this has been done they swim into the ball and gorge themselves on the sardines. The bait ball does not stay intact for long as the sardines flee as soon as the predators dive into the ball. To spot the fish, fishermen watch the sea birds. The gannets dive headlong into the water and catch a fish, then surface, take off, swallow the fish whole and do it all over again. I'm sure you've seen this on the Discovery TV Channel. When the sardines hit the beaches off Durban and Port Edward to the south, the locals get involved. While the sardines are in the bay the shark nets are lifted to avoid catching the dolphins. The sardines are driven ashore by the predator fish and dumped on the shore by the waves. Then there is a free for all, people use their hands, nets, crates and anything that will hold a fish to collect them. Everybody wants a free meal. Of course the professional fishermen take out their trek nets and pull in tons of fish to sell as bait fish to fishermen. Portuguese restaurants have a field day with sardine specials on their menus. Many fishermen come specially prepared to collect their own bait which they use for catching Shad which are found along the Durban coastline. What really attracts the tourist however is the large variety of life that this annual event attracts. As I said earlier you can see many types of whale, porpoise, dolphins and even shark in the surf close to shore. After the initial frenzy the sardines go offshore but remain in the warm waters along the Durban Kwa Zulu Natal coastline until November when they once again shoal and swim back to the Cape. The shoals being much smaller on their return to Cape Town. Tour operators offer many different packages to visitors to see this event. You can go to sea in rubber ducks and swim with a shoal, or watch the dolphins and sharks hunting the sardines, or you can just join in the fun on the beach and catch your own. The choice is yours. Make it soon as the sardine run is taking place at the moment.